What is your budget? Like purchasing any piece of business equipment, a dollar amount is most certainly a factor. Telephone equipment, like anything else, is available in many different levels of quality. For instance, there are systems that you may have never heard of that are higher quality than than some more well known brands. There are also systems that you may have never heard of that are bad news. Buying a telephone system is a decision where your top people need to be deeply involved. Why? Because telephones are basic to your productivity,and buying the wrong system can cripple your entire operation for years.You'll also want to coordinate your purchase with other equipment that you already own or may need to purchase, such as a voice mail or messaging on-hold system, phone headsets, toll fraud equipment, or tabletop conferencing equipment. There are two major types of phone systems on the market. Key systems are traditionally used by companies with fewer than 50 employees, while private branch exchanges, or PBXs, handle larger workloads. Key systems are based on the old multi-line phones that used several buttons, or keys, to access an outside line. PBXs are essentially a smaller version of the switching equipment used by the phone company to direct calls. More recently, the distinctions between the key and PBX systems have become relatively blurred. Many key systems include features that were once available only on PBXs, and some systems operate internally as either a key or a PBX depending on the software that is installed. The term "hybrid" is often used to describe systems that resemble both key and PBX systems. 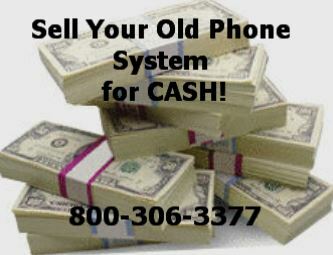 Most newer and more expensive phone systems communicate via digital technology. This means that sound is transmitted as bits of data rather than audio waves. Theoretically, digital transmission has many advantages over analog transmission. Digital signals are less affected by interference and line degradation, meaning that digital lines have virtually no static or hiss. However, most businesses make outgoing calls over regular analog lines. This means that even a digital phone system must convert signals back to analog waves whenever a call leaves the office. Because very little sound degradation occurs within the smaller confines of an office, analog systems actually sound about the same as their digital counterparts. The main reason for buying a digital system is that these systems tend to be better equipped to connect with accessories such as voice mail or caller ID. When buying a system, a primary concern is to make sure the unit is the right size for your firm. This means understanding the size constraints of the system. In the case of key systems, system size is usually indicated as a combination of "lines" and "extensions." Lines indicate the total number of outside lines used by the company, while extensions refer to every phone within the company. For example, a system might accommodate up to 12 lines and 36 extensions. In contrast, most PBXs define size in terms of "ports." Ports indicate the maximum number of connections that can be made to the system. This includes outside lines and inside extensions, as well as accessories such as voice mail or automated attendants. Even if a system can handle your current phone traffic, you also need to check that it will be able to handle your future expansion needs. The ideal system should be able to handle such expansions in a very cost-effective manner. Check which items will need to be purchased or replaced as your needs grow in order to get a good sense for your future costs.Here are some things to ask yourself. How many incoming lines and how many extensions are required? This is a two part question. Future expansion must be a consideration. Choosing the proper size of a telephone system is probably the single most important factor. You may save money buying a small system, but if there comes a time when you need to add just one more telephone or one more incoming line, you could end up spending much more to upgrade to a larger system. Systems can be equipped with literally hundreds of features for switching calls and directing traffic. However, dealers estimate that 95% of system features are never used within a company. Instead of comparing features on a one-to-one basis, you should examine how a phone system is used. Limit your feature search only to those features that will improve the work flow in the office. This will allow you to focus on the real differences between systems for your office environment. Although having the right features is important, even more important is making sure the features are easy to access. Because most employees devote very little time to learning how to use a phone system, it is very important that the most common functions be extremely simple and intuitive to use. While the smallest systems may cost a few thousand dollars to install, the price tag for more complex models can quickly climb to tens of thousands of dollars. Phone system prices vary based on four factors: The central cabinet. The central cabinet which controls and oversees the entire phone system. This price differs between systems, and rises as cards and accessories are added to a system. A small central cabinet can cost as little as $3,000, with the price increasing considerably for larger systems. The actual phones. Most systems can be equipped with several different types of phones. The least expensive sets may cost less than $100, but can make accessing features very difficult. On the other end, some "executive phones" sell for many times the standard price. These phones can make using the system slightly easier. New or refurbished? You could save considerably by purchasing refurbished telephone equipment. How do you decide? Consider this. There is usually a savings of between 20%-30% over new equipment, sometimes more on older equipment. Refurbished equipment, from a reliable source, can provide many years of dependable service. Just because telephone equipment is refurbished it does not mean it is out of date. Many businesses for one reason or another trade in their telephone equipment when it is fairly new. (Maybe they chose the wrong size system for their needs) In many cases, it is very hard to tell the difference between new and refurbished equipment by sight alone. If considering a refurbished system, check the revision level of the equipment. Purchasing new equipment offers the security in knowing what you are buying is current. The warranty is usually longer on new equipment, but not always. If you expect to use voice mail with your phone system, make sure that any phone system you are considering is capable of working with a wide range of third-party voice mail systems. By keeping your options open, you will minimize the chance of getting stuck with an inferior or overpriced product. To avoid rewiring down the road, you should request that plenty of wiring be installed when the system is first purchased. A good benchmark is to ask for at least double the wiring you currently need. While this will add to the cost of installation, it will really only be a fraction of the cost you will face if wires need to be added later. Many local phone companies charge different rates for phone lines that connect a key system versus phone lines that connect a PBX, even though both have essentially the same functionality. Check rates beforehand to see if this may affect your buying decision.